As I write this, we are a few weeks away from the UK release of Creed, the latest film in the Rocky saga. Having already been released to critical acclaim in the United States, I expect nothing but an amazing drama that has me punching along with its stars and wanting to scream at the screen the entire time I’m in the theatre. Much as I did with Mad Max back in May, I thought this would be the perfect opportunity to have myself a little Rocky refresher course before release and share it with you guys. It’s been a long time since I watched the Rocky films; I’m certain I did a quick run through back when Rocky Balboa, the series’ comeback sequel, was released. “That wasn’t that long ago, right?” I thought to myself. Wrong. It was in 2006 that Stallone’s comeback film rightleft-hooked us to the canvas. Two years before Rambo’s comeback; four years before he assembled The Expendables for the first time and – by the time we get Creed on UK shores – ten years before the Italian Stallion took up the Mickey Goldmill role of trainer to long time opponent/friend Apollo Creed’s son, Adonis Johnson – a pornstar name if ever I heard one. Forty years since we first cheered for Rocky Balboa. Forty years of ups and downs for our hero and forty years of films that don’t always live up to their heritage, but do try very hard. The original classic film and five sequels between 1976 and now; won’t you join me on my journey through the life and times of Rocky Balboa, Philadelphia’s number one son? The story of a down and out debt collector who makes a few bucks on the side boxing in clubs has become the stuff of legend. A fighter who has never lived up to his potential, almost reviled by the owner of the gym he works out in and errand boy to a petty loanshark; Rocky Balboa inexplicably gets a chance to prove himself to everyone as Carl Weathers’ Apollo Creed gives the unknown fighter a shot as his World Championship when the original contender for the belt has to drop out. Determined to grab at this opportunity with both hands, Balboa trains harder than he has ever trained before to prove to himself, his new girlfriend Adrian, and everyone watching that he deserves the shot he’s been given. Trained by gym owner Mickey, a burnt out boxer who’s happy to berate Rocky for being a bum – a recurring theme in these films, until I watched these again I never knew the insult “bum” was either used that often or really that offensive – Rocky captures the heart of boxing fans across America as he steps into the ring with he champ to fight for his self respect as much as the belt. Ending with a tense fight between the pair, Balboa fighting his heart out to prove himself and Creed fighting a guy with more spirit than he could have imagined, Rocky’s eventual split decision loss after fifteen rounds of hard hitting action leaves the world believing that Rocky won the fight, whether or not he came out with the title. Rocky is a rags-to-riches American Dream story as poignant as any made before it or since. Written by Sylvester Stallone and made on a shoestring budget, Rocky’s journey from unknown to worldwide sensation was mirrored by its star who, after the film made two hundred times its budget back at the box office, went from nobody to household name overnight. Winning three Oscars for best film, director (for John G. Avildsen) and editing, also earning Stallone nominations for his writing and acting, there can be no doubting the pedigree of the series when it starts this well. 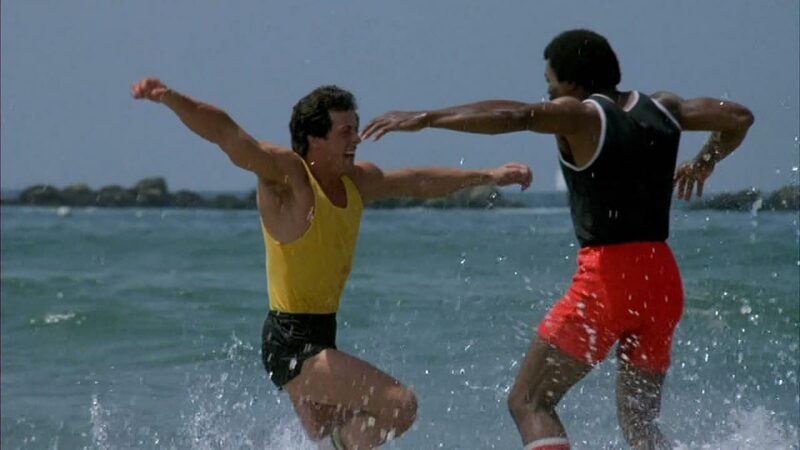 And let us not forget the two most memorable parts of Rocky. First, that most quoted and parodied call from the down and dirty bruiser after his loss, “ADRIAAAAAAAN”, and second the most famous training montage music in the history of film, that montage that made Bill Conti’s “Gonna Fly Now” one of the most recognisable songs in movie soundtrack history. There was no way a film as profitable as Rocky wasn’t going to get a sequel. We only had to wait a couple of years until Sylvester Stallone not only returned to writing duties, but took the spot behind the camera to direct as well. Minutes after his defeat at the hands of the champion, Rocky finds himself face to face with Apollo Creed in the halls of the hospital they have both been carted off to. Angry that his win wasn’t decisive, Creed immediately goes back on his word, calling out our hero for a rematch that Rocky refuses. Opting instead to retire, recover from his bout and become the family man he wants to be with Adrian. But Creed won’t accept that, spurned on by hate mail and a bruised ego, he sacrifices the high ground and bullies Rocky into a return fight. But Balboa’s heart simply ain’t in it. But the promise of a growing family means that going back to his old ways of earning money simply isn’t going to cut it. However, training for his bout puts more strain on his family than financial troubles ever would. When the stress takes its toll on a heavily pregnant Adrian, things look dire for the Balboa family as their son is born a month premature and complications leave Adrian in a coma. Spurred on by the birth of his son and his wife waking up with a new found love for Rocky’s chosen career, the Stallion gets back to training harder and working to get faster and break not only some bad habits, but his lifelong fighting stance. Training orthodox instead of his natural southpaw – something that isn’t mentioned again across the next few films, I’m guessing it was a production choice to make it easier for a right-handed star to train and fight convincingly – to fool his opponent and get an early advantage over an angry Creed determined to knock out Rocky in the first couple of rounds. Once again he’s seen running through the streets of Philadelphia to get his stamina up, but this time joined by a few hundred kids for his stroll through the community that looks up to him so much. In a repeat of the original’s montage, his run ends at the top of the steps of the Philadelphia Museum of Art to the same “Gonna Fly Now” soundtrack, but this time joined by a school full of children clearly bunking off in the middle of the day! Fight night! Win, lose or draw Balboa has the moral victory over the champion, but this time Rocky wants to win decisively. Another tense fifteen rounder that has me on the edge of my seat the entire time is the order of this sequel. This time, a last second knock out of the champion gets Rocky the belt, Adrian the win she made her husband promise and us out of our seats cheering. No Oscar nominations for Rocky II, but as the second of a one-two punch after the first, an excellent, beautifully filmed drama that gets the palms sweating and the heart pounding. Two films grossing over 200 million dollars? A third film was absolutely on the cards. Although, in a post Raging Bull world, Stallone’s writing and direction had to come up big to make a statement and, depending on who you talk to, it either blew those expectations away, or failed miserably to meet them. Me? I kind of sit somewhere in the middle. After taking Creed’s title from him, Rocky rolls through every contender put in front of him for the next couple of years. Content to enjoy his celebrity life and retire an undefeated champion, Balboa is called out and bullied into a title defence by the number one contender, a dangerous man named James Lang, nicknamed “Clubber”. Played by a relatively unknown Mr. T (just before his A-Team days), Clubber hands Rocky his most vicious and calculated beating, taking his title and embarrassing our hero in front of his home town. Beaten, broken and dealing with the loss of his friend and trainer Mickey, Rocky wants a shot to get his title back but lacks the tools to get the job done. Enter Apollo Creed. Rocky’s long-time rival offers to train him, to get him fighting fit and to teach him to be a boxer; not just the bruiser that once won him the championship. His only fee? Rocky owes him a favour once it’s all over. Flying out to California and going back to Creed’s original gym, Apollo and Rocky set about preparing the former champion for his bout against the monstrous Clubber. New fitness regimes, new ways to train and new techniques has Balboa as well prepared as he is going to be to face the man that took his title. In his rematch, Rocky utilises all he’s learned from Apollo and outfights Lang, forcing the bigger, stronger man to tire himself out early on and sets him up for a nice, early victory; knocking out Clubber Lang in the third round and winning back his title. And Creed’s favour? A third match between the pair, no crowds, no cameras, the decisive rubber match to see which of the pair is the greatest. In my opinion, Rocky III doesn’t live up to the previous instalments. It was the beginning of a drop in quality for the series that was only slight at this point. Besides cementing Mr. T’s “I pity the fool” catchphrase into the annals of film history and introducing the world to Survivor’s “Eye of the Tiger” – a song that became so famous that just me mentioning it back there will have it stuck in your head for a bit – this third entry to this franchise should have been the end of it.